Spices can be called the heart of any dish since they provide the dish its taste, flavour and pungent richness. As such you need to pay attention to several things at the time of buying spices so as to make the right choice and enjoy rich flavours in every dish you prepare. Any Indian spices wholesaler will tell you that if you are purchasing online then check the reputation they have. Going through reviews will give you the best idea about quality of their spices. You can also take references from your friends and family members about where to buy from since you get very good references from such reliable sources. You should avoid buying from typical grocery stores since it is quite likely that many of the spices have been sitting on the shelves for several months at a stretch and may have gone stale by the time you purchase them. You should ideally buy whole spices and put in some effort to grind them on your own for retaining their fuller flavor as well as potency. 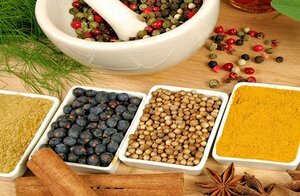 One of the reasons to buy whole spices in India from any Indian spices wholesaler is that they will remain fresh for longer duration in comparison to ground spices. The risk of purchasing ground spices is that you cannot figure out whether there are other ingredients mixed into it, as for example, flour, rice or salt. But if you buy whole spices, you will have the assurance that you are buying the right thing. The best thing to do while buying spices is to purchase small quantities since within a few months they will become stale. Apart from that if you are buying high quality spices then you will not require a lot of spices to be added in your dishes since a small amount will be enough to perk up your favourite dishes. This entry was posted in indian spices, Indian Spices Wholesaler, Spices in India.